The Prankster was asked for help by a small company. In March 2017 they had received a worrying county court claim from a law company called SCS Law (a trading name of LPC Law), alleging that one of their vans had been parked on several occasions on the estate which their client UKPC managed the parking for. This was the first they had heard of this, so they requested more information, which was duly emailed to them. The van was a company van which had been parked at the house of an employee at night. SCS Law alleged that no commercial vehicles were allowed on the estate between something like 19:00-07:00 and UKPC had “charged” the member of staff with this offence at various times in the middle of the night – midnight etc. The employee had no recollection of this happening, and did not receive any windscreen tickets. UKPC had sent everything to the previous address of the company, who did not receive any of it, even though redirection was in place. Unfortunately there were two buildings on the site with very similar addresses and the same postcode, and a large amount of post had gone missing. The employee made enquiries and found out that UKPC do operate the parking there. New signs had been fitted around his estate, but these were done in late December – all of the charges were from October and November 2016. The judge was not impressed by SCS Law's bundle. She ruled that the company had no keeper liability; although they were the registered keeper of the van, they were not the keeper for the purposes of POFA 2012, which defines keeper in a different way. The staff member who used the van was the keeper. The driver was also not acting as agent of the company, because this was private use after the working day had finished. No contract was formed with the driver because the signs were poor and not visible at night when the tickets were issued. The paperwork had also not been received within the mandatory time period, and was therefore out of time to establish keeper liability. There were a number of other flaws with the case, any of which could also have rendered the charges invalid. The signage was forbidding, which would make any contravention a trespass, and the charges invalid as per the rulings in ParkingEye v Beavis  UKSC 67. The UKPC contract appeared to be with a company which was dormant. It was not apparent why UKPC thought they could override the rights of the home owner to park on his own drive. The operation appeared to be a self-ticketing one, with part of the income from each ticket going to the management company. This would appear to contradict their claim they were dormant. which it was decided not to use were not explored. 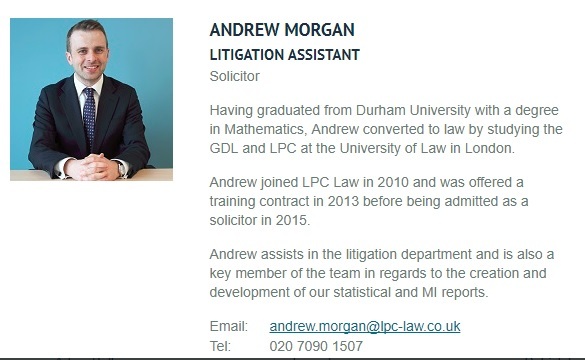 The claim was handled by Andrew Morgan. The claim was so flawed that The Prankster questions the judgment of Andrew Morgan for his handling of the case. SCS Law claim to be experts in parking law, but on this showing The Prankster can only conclude that they are completely incompetent. The buck has to stop somewhere, so the Prankster holds director Len Crowder to account. If Len is not ensuring Andrew is trained properly, and apparently failing to ensure he has basic knowledge of the law surrounding parking, then this is partly Len's fault too. 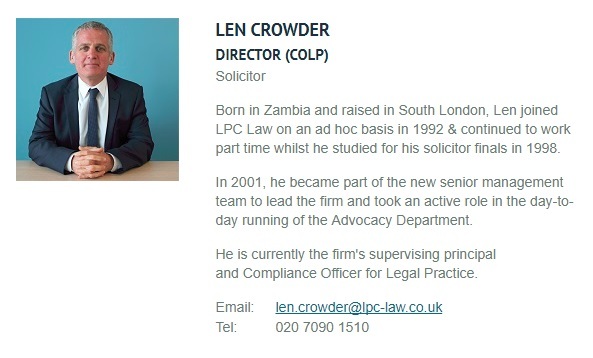 In the Prankster's opinion Len is failing his duty to his client by filing no-hope claims and taking his client's money without apparently fully appraising them of the risks involved. Really, if you are holding yourself up to be experts in some area of law, you should at least have basic knowledge of the issues. We are a firm that specialises in litigation on behalf of private parking companies. Did you book parking online at Liverpool Airport? A parking space was booked online with a company called Liverpool Airport Limited. The car was duly parked at the airport. On returning from the trip, Foodwithaface found that the vehicle has a windscreen ticket, issued by a different company called Vehicle Control Services. The ticket claimed the vehicle has contravened some new terms and conditions which were not present on the web site. She therefore appealed to VCS, who as usual dismissed the appeal. The dismissal appeared to have little in common with the actual appeal. Foodwithaface therefore started a Facebook and Twitter campaign highlighting the problem. After a short time Liverpool Airport relented and cancelled the parking charge. If you have booked online at Liverpool Airport and been issued with a parking charge, then you may have grounds to either get it cancelled; or, if you have paid, get the money refunded. There are two issues in play here. Firstly, if you have entered into a contract to park with Liverpool Airport Limited, then Vehicle Control Services are not a party to that contract and therefore have no rights to charge to for breach of contract. Liverpool Airport could of course get VCS to enforce the contract on their behalf - but that is clearly not what is happening - the (not a) parking charge notice claims that VCS are the creditor, and not Liverpool Airport. The second point is that once you have entered into a contract with somebody, the other party cannot unilaterally alter it. They cannot, for instance, introduce additional terms and conditions which were not originally present. The terms and conditions do not mention that there is a parking charge for contravening the contract. The ParkingEye v Beavis case in the supreme court shows that it is crucial for the existence and level of any charge to be prominently brought to the attention of the motorist at the time the contract is in force. If it is not, then it is likely to be an unfair term breaching the Consumer Rights Act 2015. On another level, it is extremely worrying that the DVLA is giving out keeper data to a company who appear to have no rights to request this. The DVLA give this data out without putting any robust processes in place to check that the request is valid and that the company has the right to this data. This is a clear dereliction of duty by the DVLA and may also be a breach of data protection legislation. Liverpool Airport changed their terms and conditions on about 7th December. The new text is as follows. 5.2 Customers should park vehicles only within designated bays, within authorized areas and so as not to cause obstruction, failure to park within a designated bay may result in a Parking Charge Notice. However, this does not properly provide the information about parking charges required by Beavis, such as the charge level and the full set of reasons for charges. It also does not address the fact that VCS are still not party to any contract, and so have no rights to any charges. Is Bryn Holloway Lead Assessor of the Independent Appeals Service corrupt or incompetent? The Prankster has been made aware of yet another bogus decision by the kangaroo court run by the the IPC, as detailed in this MSE thread. The vehicle keeper was not the driver, and based their case on the fact that keeper liability did not apply in this situation. The parking company stated that they were claiming against the vehicle keeper and that keeper liability applied. The vehicle keeper informed the IAS that they were not the driver and appealed to the IAS on the single point that keeper liability did not apply. This was because the notice to keeper failed to specify the land where the vehicle was parked and also was not delivered in the correct time. 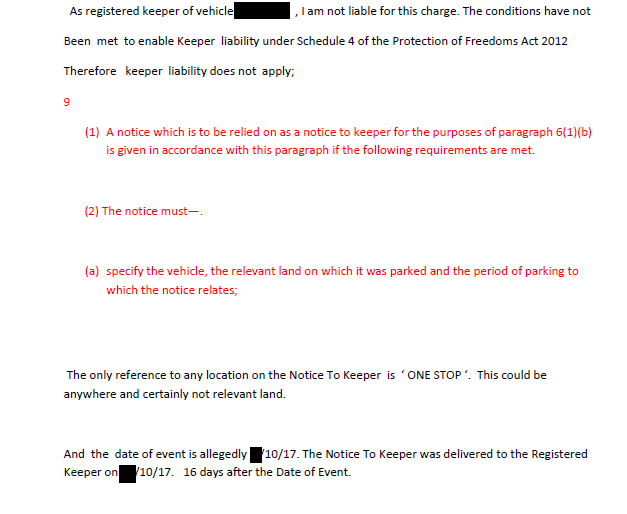 The Protection of Freedoms Act 2012, schedule 4 makes the keeper liable for parking charges in certain circumstances. This is a quite incredible concession which does not exist anywhere else in contract law - that someone can be liable for a contract entered into by another person which they have no real knowledge or control over. In return for this, the parking companies have to obey a few minor rules. It is completely fair they they need to tell the keeper where the vehicle was parked. Without this information, the keeper is completely in the dark. Clearly 'ONE STOP' does not fulfil this requirement. If this is perhaps a shop, then there are over 770 of these in England, Scotland and Wales. The notice also has to be served within a specific time frame. The parking company claim they posted it within the time frame, but this is not the requirement. The requirement is that it arrives in the timeframe. The parking company also failed to provide any evidence of posting. As there is no reason to disbelieve the fact that the letter arrived out of time, and the parking company are not disputing this, then clearly keeper liability does not apply. So how then does the assessor deal with this minor irritation which blows the parking company case out of the water? Simple. They rule the late delivery as an inadmissible appeal point and tell the keeper to refer any complaints to the IPC. As for the relevant land point, this is silently ignored. The assessor claims to be a barrister or solicitor (although they apparently do not know which they are). It is therefore ludicrous that they are unaware of the basic law surrounding keeper liability and they also demonstrate a beginners failing to understand the law of contract. It is also bizarre that a person who claims to be legally qualified is unable to deal with both points of a two point appeal. Bryn Holloway is the lead assessor of the Independent Appeals Service and the buck stops with him. This is not an isolated incident. Pretty much EVERY appeal to the IAS which the Prankster has been made aware of is not dealt with correctly by the assessors. When complaints are made, the IAS does not investigate them but instead send back a template reply stating that it cannot investigate the complaint because this would affect the impartiality of the service. Therefore, in the Prankster's opinion, this is clear and unambiguous evidence that the process is not fair, but is biased against the motorist. The service is set up to be difficult to use by the motorist - for instance, they cannot paste into online entry fields, but must type everything out. The service claims to be an ADR Entity, but fails to comply with the requirements for being an ADR Entity. Bryn Holloway should be ashamed of his disgraceful behaviour in the way he runs this service. If he is running the appeals service in this way knowingly, then The Prankster believes that the man on the street can only class this corrupt behaviour - Bryn is essentially colluding with parking companies to defraud motorists out of money they do not owe. If he is running the service in this way unknowingly, then by definition he is incompetent. A fair appeals service needs a strong character who can stand up to the parking companies and the trade association, and run it in an impartial way. The position of lead assessor is vitally important in an industry staffed by chancers, fraudsters, bullies and incompetents. There are good people in this industry, but they are disadvantaged by having to compete with bottom feeders allowed to get away with anything. It does not need someone like Bryn Holloway who appears on the available evidence to be a weak character, and no more than a lapdog for Will Hurley and John Davies. So Mr Holloway, which is it? Are you corrupt or are you incompetent? Either way The Prankster calls on you to resign and make way for someone who can do the job in a fair and impartial manner. This was a case I picked up from the Pepipoo forum. The Claim was for £2,560 + fixed costs, for 16 tickets accumulated at the Defendant’s previous residence. His wife had been the Leaseholder of the property, and the Lease granted exclusive use of a numbered space, with no mention of any need to display permits, or to pay penalties to a third party. Primacy of contract was therefore the strongest defence argument, and all of the relevant authorities supporting this point had been included in the bundle. I agreed with Mr Carmichael beforehand, that we should ask the Judge to rule on that point as a preliminary matter, because if the defence succeeded on that, everything else was irrelevant. But when we went into Court, the DJ started laying into the Claimant’s advocate, saying that they had filed a bundle comprising 400 pages, and how was he supposed to deal with that in a 2 hour hearing. He also said their Particulars did not address the point made by the Defence about the Lease, and they hadn’t explained how their contract with the managing agent could constitute a variation to the lease terms. It got worse. He then turned to the redacted contract in the Claimant’s bundle, saying the Directions had clearly said that the original should be produced. I then pointed out that, even if the copy contract could be admitted as valid evidence, that didn’t assist the Claimant. The party named on the contract was “The Residents of Park Centrale C/O Hazelvine Ltd”. Hazelvine are the managing agents, but there is no legal entity such as the residents, or any unincorporated residents’ association, and the Defendant had lived there for five years and never heard of them. The contract was also for 12 months, and dated 2013, so didn’t cover the dates in question. The DJ said he needed to consider what weight to give to that evidence, the answer being zero. The DJ then returned to the central point, which was that the case could not proceed unless the Claimant could show whether and how the Lease terms had been varied. He said that the Claimant should have requested permission to amend their Particulars pursuant to CPR 17.1, once they had sight of the Defence. Mr Carmichael requested a short adjournment to take instructions, and went off to phone SCS Law. Upon his return, he asked if he could make a verbal application now, under the informal procedure of the small claims track. The DJ was having none of that, saying that the Defendant was already at a disadvantage because the Claimant’s witness was not there to be cross-examined. So he gave his Judgment. He said that the Claimant’s solicitor was attempting to pull rabbits out of a hat, and that wouldn’t work in his court. The Claimant was a Limited Company with extensive resources, and had used solicitors to conduct their case. If he allowed an adjournment for the Claimant to file new particulars, it would then probably be re-listed a few months later for a full day hearing, which was not a proportionate use of Court resources. He also noted that the Defendant had had this hanging over him for several months, and it would not be just or fair to make him wait longer for the outcome. Claim dismissed, and so on to costs. The ordinary witness costs of £103.60 were agreed without argument, and we had filed and served a costs schedule for further costs based on unreasonable conduct under CPR 27.14(2)(g). The DJ said that the Claimant’s behaviour had been negligent rather than unreasonable, but he did allow a Lay Representative fee of £105, so a total of £208.60 awarded to the Defendant. Rupert William's UKPC is a disreputable company which has survived two prosecutions by Trading Standards, and widespread fraud by their wardens doctoring time-stamps on photographs to falsely accuse motorists of overstaying. Now they have been caught issuing tickets at a place where it seems impossible they had a valid contract. It the DVLA are to keep handing out keeper details, some form of balance and control is needed to protect the public from rogues and charlatans, and some form of appropriate penalty is needed to curb irresponsible behaviour. If the DVLA are too scared to ban parking companies, then perhaps some lesser penalty is needed. The Prankster suggest it might be appropriate that motorists get automatically paid £100 by the parking company if a ticket is found not to be valid. Oh yes, and congratulations to Bargepole for another excellent court appearance. The Law Society Gazette has published an article warning that the courts are buckling under the number of claims issued, which has reached a 10 year high. From July to September this year, the Ministry of Justice reported that 560,000 claims were issued in the county court – the second highest quarterly figure since 2006. Of these, 445,000 were specified money claims, a figure which was up 15% on the same period in 2016. The number of claims being defended increased year on year by 5% to 76,000. If there have been 76,000 hearings between July and September, we can estimate there are 304,000 per year. The Gazette figures also imply 1 in 7 claims goes to a hearing. Has the Parking Industry contributed to this problem? Undoubtably. The British Motorists Protection Association keeps a tally of the number of parking hearings. Although it is not informed about all of them, there have been at least 6,828 of them (not including set-asides and re-hearings) this year. On this basis, parking companies file about 48,000 claims a year. Parking hearings also contribute just over 2% to the total number of hearings. Will Hurley and John Davies have therefore set themselves up as judge, jury and executioner, with a nice little conveyor belt going. They set up a trade association apparently designed to attract the rogues and bottom feeders of the industry. They dismiss motorists appeals on bogus grounds not in line with decisions made by the real courts. They then feed the charges through from the IPC to Gladstones, funding the costs themselves, but adding an estimated £125 per claim for their own pockets (£50 debt collection charge, £50 filing fee, £25 court fee). Even though Gladstones have proven themselves to be totally incompetent in court, their approximately 4,000 hearings can be viewed as something of a loss leader. It is the 28,000 cases which never get to court which are the true business model of Gladstones, who are creaming in an estimated £3.5 million from a largely automated process requiring no effort or thought. It is interesting that a pair of scoundrels can make themselves rich through a business model which disregards the fact that they are hopeless in court, (as often reported), but instead relies on bullying and intimidation to make motorists pay charges which based on Gladstones record, they would not be liable for if the case went to a hearing. In December 2013 my daughter received a Parking Charge Notice (PCN) from ParkingEye after over-staying a 2-hour free parking limit at Rivington Services (otherwise known as Bolton West Services) on the M61 Motorway. When we received the PCN we carefully investigated the ANPR system on site and discovered that although the cameras had planning permission the associated signage did not have advertisement consent. The Council’s Enforcement Officer contacted the landowner and / or private parking company (PPC) and requested them to apply for consent for the signs, and this consent was eventually granted in April 2015. The planning documents stated that the signs had been erected in May 2011, i.e. some four years prior to receiving consent. Having not received any of the original PCN papers due to problems with the post, my daughter found herself with a CCJ which we attempted to have set aside. We were in court five times, what with adjournment, stays to await Beavis verdicts and then the set aside application itself. At the final hearing in 2016 at the Bolton County Court we relied, you might think unwisely, on a defence that the signage was illegal. ParkingEye’s Claims Handler, David Greenbank, although not attending the hearing, had submitted a Skeleton Argument containing a claim that they had been granted planning permission for the signs retrospectively. The judge found in favour of ParkingEye and anyway we had run out of time and he was anxious to move on to the next case (back-to-back parking cases). We had evidence to prove our case, but weren’t allowed to present it. Some time later I came across another case heard at Barrow County Court in May 2015 where again ParkingEye were Claimant. Indeed the very same Claims Handler, this time in a Witness Statement bearing a statement of truth, made the same claim: that they had been granted planning permission retrospectively for the cameras and signage. Then I came across a third case, this time involving the car park at Dovecot Street, Stockton-on-Tees and a CAGger known as ‘terrier82’ who on 11th November 2016 reported: “Lost in court today, said due to the retrospective application making it legal.” It looks as if yet another judge had been persuaded by this retrospective signage planning permission scam. Tracing back through the ‘terrier82’ CAG thread to 29th June 2016 I found a copy of a Defence to Counterclaim Document indicating that the Claimant was once again ParkingEye. I wondered how many more cases they have won based upon false evidence? They didn’t get away with it at Crewe County Court in September when the judge found their evidence was “tantamount to perjury” (https://www.blogger.com/parking-prankster.blogspot.co. uk/2017/09/parking-eye-witness-tantamount-to-perjury.html). So at Bolton, at Barrow, at Stockton and finally at Crewe County Court a single PPC has tendered evidence that cannot be true. Please send in your comments if you know of others. Incensed by losing our case in court, and seriously concerned about possible miscarriages of justice, I set about investigating possible abuses of the planning system. For several years retired solicitor Robert Ransome had done some sterling work in listing private car parking sites that lacked planning approval. I decided to conduct a comprehensive forensic investigation into planning as it relates to private car parks. I have now investigated over 400 sites, including all the ‘usual suspects’. The results are astonishing. At around three quarters of the sites I was unable to find advertisement consent for the parking signage. At almost all of the remaining sites advertisement consent applications were made for signs all of which were illegally in place. Usually these applications followed complaints made to the Local Planning Authority (LPA) by members of the public, councillors and in one case a solicitor. The belated applications ranged up to 10 years post- installation, with an average of some 30 months. It was extremely unusual to find a single site where planning had been applied for in advance which, in most cases, we are all legally required to do. Soon I discovered that over five or more years the PPCs have been playing a cat- and-mouse game with the LPAs. Of the 400+ sites studied I found 60 where the LPA, almost invariably after receiving a complaint, directed or requested that the advertiser apply for planning permission and / or advertisement consent. Searching through vast numbers of planning registers I noted the criteria involved in private car park planning. Meanwhile, I contacted scores of LPAs and asked whether planning approvals can be back-dated, because ParkingEye clearly purports that if a site didn’t have planning approvals these could always be obtained later. To date, 133 LPAs have responded and almost without exception they state that ANPR cameras require planning permission (as land is being developed), and parking signs are classed as advertisements and normally require advertisement consent, a completely separate and parallel system to planning permission. Almost invariably the LPAs consider parking signs each smaller than 0.3sqm in area as having ‘deemed consent’, and signs exceeding this size as not having deemed consent but requiring ‘express consent’ under Class 2, Schedule 3 of the Town and Country (Control of Advertisements) (England) Regulations 2007 (or the Welsh equivalent, the 1992 Regs). ANPR cameras attached to buildings have deemed consent - e.g. under the Town and Country Planning (General Permitted Development Order) 1995 - but cameras mounted on new, dedicated free-standing poles (as most ANPR cameras are) normally require planning permission. This planning permission can be applied for belatedly, and after four years unauthorised cameras are immune from enforcement (see, for example: Beehive Centre, Cambridge; Peel Centre, Stockport; and Welcome Break, South Mimms, Motorway Service Area). The situation for advertisement consent is quite different. Advertisements do not become immune from enforcement until 10 years after installation. Anyone who displays an unauthorised advert commits a criminal offence, and it is immediately open to the LPA to bring a prosecution in the Magistrates’ Court under s.224 of the Town and Country Planning Act 1990. The penalty on conviction is currently up to £2,500, and in the case of a continuing offence a further daily fine of up to £250 until the contravention ends. Where a LPA achieves a successful conviction for failure to comply with an enforcement notice they can apply for a confiscation order under the Proceeds of Crime Act 2002, to recover the financial benefit obtained through unauthorised development. This power is not used often. Government policy, however, is that LPAs should not rush to prosecute, and the authorities have expressed concern about the financial risks of losing against large commercial concerns with deep pockets. So what tends to happen when a PPC is detected as having unauthorised ANPR cameras and / or signs is that the LPA politely requests them to apply for the appropriate approval, which is almost invariably granted. Only if an advertisement is considered to be detrimental to public safety or amenity can it be refused. Of the 60 sites where I found LPA enforcement against PPCs / owners, 55 complied with the enforcement deadline, which is normally 7 – 28 days. At the remaining 5 sites the deadline was breached by one month (Aldi, Blaby; and North Tees Hospital), two months (Hindpool Retail Park; and Corner House Retail Park), and three months (The Range, Barrow). How ironic, that a PPC that pursues parkers / keepers for overstays of mere minutes can itself breach planning enforcement directions by months! Such hypocrisy! So the first big question is: Do private car park parking signs comply with the rules? Do they have deemed consent? Answer: No, they almost always exceed the 0.3sqm area threshold. The largest sign eligible for deemed consent would be around 550 x 550mm (area approx 0.3sqm), the sort of size we see occasionally in car parks as repeater signs. The Planning Portal states: “You may need to apply for advertisement consent to display an advertisement bigger than 0.3 square metres.....” . Virtually all private car parks have signs larger than this threshold size, and most car parks have at least one large sign, e.g. at the entrance. And it only takes one large sign amongst many to break the rules. Some PPCs, e.g. ParkingEye, often have standard sizes of signs at their sites, e.g. 600 x 800mm = 0.5sqm area, and all of these require express consent from the LPA. It is interesting to note that Riverside Retail Park (Chelmsford) did not have advert consent at the time Barry Beavis received a PCN there, but the issue was not raised by the defence. (Footnote: The LPA says that they would have granted planning permission and advert consent if an application had been made). In the present study of 400+ sites, 305 (over 70%) appeared to have no advert consent whatsoever. A further 98 (approx 25%) did not apply for advert consent until they were ‘outed’ by complaints from the public. By that stage they may have been issuing parking charges for many years, even ten years. The average time of lacking consent was around 30 months, and many thousands of unauthorised parking charges may have been issued per site during that time. In total, millions of victims may have been unfairly penalised. (In most of these cases it was ParkingEye that applied for the planning, despite their false claims that they were not able to apply). The second big question is: Can PPCs obtain advert consent retrospectively? The answer is a definite “NO”. There is no such thing as retrospective advert consent. This is confirmed by virtually every LPA contacted. Space does not here permit a full recital of other evidence that supports this statement. However, in the Court of Appeal in the case of Andre Agassi v. S. Robinson (H. M. Inspector of Taxes)  EWCA Civ 1507 there was a modern slant on the old dictum that nobody should profit from their unlawful conduct. At  and  is stated that costs recoverable in litigation cannot include the costs of any activities that are unlawful. Illegality defences were explored in the Court of Appeal in ParkingEye Ltd v. Somerfield Stores Ltd  EWCA Civ 1338 where Laws L.J. at  concluded that ParkingEye, when contracting with Somerfield, did not at the outset have an intention to deliberately break the law. Consequently he upheld the contract. Contrast that with this present situation where some PPCs have deliberately broken the law by erecting their contract-bearing signage without first having in place the mandatory prior advert consent required by law. As we have seen, any unauthorised advertising constitutes a criminal offence which will remain so for all time. Such illegality cannot be reversed by a subsequent grant of advert consent. In contrast to the Somerfield situation, where illegality was incidental to the contract and unintentional, here illegal wrongs have been committed at the time of entering contracts with defendants. Furthermore, the wrongs are deliberate, are central to the contract, are criminal (not civil torts) and are repeated at multiple sites on multiple occasions over half a decade or so. The scale is industrial. While the debate continues about legal issues, there is another important issue to consider: adherence to codes of practice. In order to obtain the details of a vehicle’s registered keeper from the DVLA a PCC must be a member of an Accredited Trade Association (ATA) that is recognised by the DVLA. There are currently two ATAs: The British Parking Association (BPA) and the Independent Parking Community (IPC). Both ATAs have an Approved / Accredited Operator Scheme (AOS) and a Code of Practice (CoP). Every version of every CoP that I have seen requires their Member PPCs to conduct their businesses according to the Law. To summarise, the PPC (whether a BPA member or an IPC member) has an overriding duty to comply with the law in creating and enforcing its contract with a motorist (or, by extension under the Protection of Freedoms Act 2012, with a vehicle’s keeper), and in communicating the terms of that contract. Many of us have complained to PPCs, to the BPA and to the DVLA but all deny that there is a problem – every complaint seems to be suppressed. What we have here is a vast gravy train of citizens’ money, continuously gaining speed and now out of control. The ATAs are not independent, being funded in a cosy arrangement with the PPCs, and turkeys don’t vote for Christmas! The DVLA, too, are turning over vast amounts of our money in data access fees; they continually claim they do not profit from this service, but the costings they have produced seem to be more akin to those relating to manual (V888) enquiries rather than electronic enquiries which appear to operate with minimal human involvement. There may be questions about the statistical sampling method used in this study. Sites were investigated initially because they were high-profile, controversial car parks, and of course it may well be that low-profile orthodox sites may be missed. For that reason, the study is being extended and another 400 sites are currently under investigation. Planning registers are now being searched, not only by postcode / applicant name, but non-specifically using catch-all searches on key- words such as ‘ANPR’, ‘camera’, ‘recognition’ and ‘automatic’. To conclude, this study raises serious concerns about the monitoring and regulation of private car parks. These results form part of a much larger report to be presented to MPs in advance of a Parliamentary debate on self-regulation listed for the New Year. Meanwhile, PPCs should be held to account and should refund all those parking charges gained at sites that are or were being operated in breach of the law and CoPs. There is particular concern that many PPCs are claiming to operate within the CoPs when they are actually in breach; they use the CoP as a kind of veneer or cloak of respectability and the public and authorities are being seriously misled. These interim results will inevitably fuel demands for the introduction of a proper independent statutory regulation system, since self-regulation really isn’t working. It is of course very worrying that private parking companies such as ParkingEye charge motorists huge sums for trivial overstays, while operating a deliberate policy of not complying with the law. One thing to note that may be of interest to you motorists is that the majority of sites, there is no planning permission. We operated a model of retrospective planning. So get the go ahead from the client, bang the system in and then if there was any noise file a retrospective planning order. Point was to save on costs. And it worked. Shuteyepark has done a vast amount of research regarding planning permission and advertising consent. His research can be downloaded from here. Excel Parking Services Ltd vs Clever Car Finance Ltd. D6DP7R03.12/12/17. Skipton County Court. The company was the owner of the vehicle but not the Registered Keeper. The driver – Mrs R, was an employee and insured to drive the vehicle. On the date in question Mrs R was using the vehicle for personal reasons, on a shopping trip with her 3 year old child. The Pay and Display machines at Cavendish Retail Park were not accepting coins and so Mrs R was unable to obtain a valid ticket. She tried for several minutes. She then attempted to find the car park attendant for assistance but was unable to do so. Being unable to obtain a ticket or find assistance she left the car park. The first communication received by the company defendant was a ‘Final Reminder Notice’ (FRN). The FRN explained that it was “now too late to appeal”. Mrs R immediately responded from her personal email account explaining that she was the driver. Excel replied to say the “appeal” was rejected. 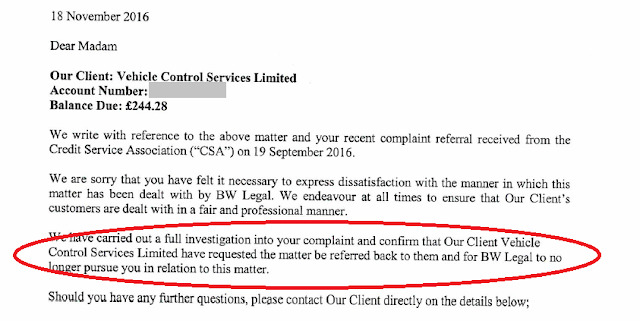 Mrs R sought advice from a Facebook group, at the same time the company started receiving debt collection letters from BW Legal. She used a paid for appeal service to send further emails to Excel denying liability for any debt. The emails were ignored and the BWL letters continued. Eventually court papers arrived addressed to the company. In total 4 emails were sent to Excel, all in the name of the driver with no mention of, or reference to, the company. Not understanding the particulars of claim or the legal difference between herself and the company, Mrs R submitted an internet template defence which did not address the pertinent points and made irrelevant arguments. The case was allocated to the claimant’s home court in Leeds. Seeking advice from another Facebook group, Barry Beavis put Mrs R in touch with Ian Lamoureux who agreed to assist with the case and Lay Rep for the defendant. IL advised Mrs R to request the case be re-allocated to the defendant’s home court in Skipton, which was granted. He then advised on an email to Skipton requesting an ‘unless order’ for the claimant to state their cause of action against the company defendant. No response was received. It never became known what cause or reason the claimant had to pursue the company. IL assisted with writing a witness statement. This inevitably contained statements contradictory to the defence. The evidence relied upon was the first email from Mrs R; proof that the company was not the RK; a sworn affidavit by Mrs R stating that she was using the vehicle for personal reasons unconnected with the company. Cases relied on were Excel vs Smith, C0DP9C4E and C1DP0C8E ( CPS vs AJH Films does not transfer liability from driver to keeper). IL also assisted with a skeleton argument to directly rebut the claimant’s witness statement and highlight their unreasonable conduct. IL was advised and supported at various stages by Coupon-Mad (SchoolRunMum) and Bargepole. Excel v Jennings C6QZ0T47, a small claims hearing where the judge surprisingly found that family members were acting as agents of the registered keeper. IL had assisted with creating a ‘preliminary matters’ document, amended from Bargepole’s template to include a section disputing the claimant’s witness statement being written by a paralegal who claimed to have “conduct of action” – a ‘reserved legal activity’. The claimant had not failed to comply with CPR 27.9 because they were represented by an advocate, therefore in attendance. The advocate had RoA because he was instructed by Elms Legal who were registered with the SRA. The hearing began with Mr Pickup conducting a lengthy cross examination of Mrs R focussing mainly on the first email and the claimant’s assertion that it was sent on behalf of the company as it didn’t expressly state that it wasn’t. Mrs R stuck by the statements in her witness statement and skeleton argument that the email was written by her personally, in her name, and made no reference to the company. Mr P’s delivery was shaky and nervous and some of his questions were directed to Mrs R personally rather than as the company representative. IL had to intervene more than once to point out that Mrs R was here as the company representative and not personally the defendant. IL was eventually reprimanded by the Judge for assisting Mrs R with her evidence under CE. The claimant had stated in their witness statement that the first email response to the FRN was sent by the company from a company email address. They had adduced the email into evidence but the print out (perhaps deliberately) did not show the top of the email with the ‘from’ address. The defence had adduced the same email showing that the email was sent from Mrs R’s personal address. This was damning to the claimant. Judge Wright went through the rest of their witness statement which offered nothing by way of actual proof or even persuasive evidence that the company was liable. She dismissed CPS vs AJH Films as irrelevant and said the Jennings case did not bind her, nor did she find it persuasive. She drew attention to some of the irrelevant and contradictory statements in the defence but accepted the defendant had submitted an internet template defence which it did not really understand. She said this was a common problem for defendants. In summing up Judge Wright said the case rested on whether Mrs R had been given either expressed or implied authority from the company to enter into a contract on its behalf at the material time. It was incumbent on the claimant to prove or convince her of such on the balance of probabilities, which it had failed to do. IL made a strong argument for costs pursuant to CPR 27.14(2)(g) on the basis that the claimant never had any right or reason to pursue the company in the first place and had full knowledge of who was driving prior to action being commenced. It had ignored all reasonable attempts by Mrs R to engage in pre-action correspondence in order to narrow the issues and avoid litigation. It had also submitted false evidence in order to mislead the court. Judge Wright disagreed that this crossed the threshold of unreasonable behaviour and awarded costs only for travel and parking. Interestingly, after dismissing the case and dealing with costs. Judge Wright gave Mr P a lengthy ‘talking to’ about Excel’s woeful particulars saying they did not comply with CPR part 7 or the accompanying practice direction. She said she sees this all the time and all the judges at Skipton are fed up with it. She went on to say that she understands there are a limited number of characters that can be used but that most other PPCs get around this by submitting separate, more detailed particulars. She explained that if the PoC had been brought to the attention of the court earlier she would have issued an order for further and better particulars. She urged Mr P to make sure this message was delivered back to his client. It would be clear to anyone with the slightest legal knowledge that there was no possibility of successful claim against the company. They were not the driver or keeper of the vehicle. The driver was not acting as their agent and the vehicle was not being used for company business. This was therefore nothing more than clumsy attempt at bullying. From the conduct of this case it is clear that the owners of Excel and BW Legal are morally bankrupt and it is especially worrying that they have apparently attempted to present evidence in a clearly false way. They are essentially demanding money under false pretences. The Prankster therefore has no hesitation in stating that in his opinion Simon Renshaw-Smith of Excel and Sean Barton and Rachael Withers of BW Legal are morally corrupt individuals who should not be in the industries they work in. Their businesses are run in a shambolic way with woeful understanding of the legislation and responsibilities in their industry sector. They have poor regard to consumer rights and their responsibilities to their customers. Mr Pickup does not escape censure for his behaviour either. He needs to be reminded that his primary duty is to the court, and that if his client is attempting to mislead the court in the way it presents evidence he should not allow this. Perhaps he can take a moral lead from the prosecuting barrister in this case. There, as soon as the barrister, Jerry Hayes, found that the police were withholding evidence which undermined their case, he disclosed it. The Prankster believes that as soon as it was clear to Mr Pickup that his witness had lied, he should have requested to halt the hearing to ask for instructions, and if his client refused to drop the claim, then he should have considered his next actions carefully. On a legal note, it is worth pointing out that CPS vs AJH Films refusal to appeal, it was found that "This case involves a decision on the particular facts." Therefore, while it is clear that a driver can be acting as an agent of a company in some circumstances, it is also clear that in other circumstances they are not. As the facts themselves were not disclosed, this is not therefore useful case law. The judgment is concerned whether or not an appeal would be allowed, and as one of the reasons was that the appellant did not turn up, this further lessens the usefulness of the case. In The Prankster's view, Mr Pickup was therefore either legally incompetent to try and use this case; or, if he was actually aware of its shortcomings without clearly bringing these to the attention of the judge, then he was underhand and despicable; his duty is to the court. 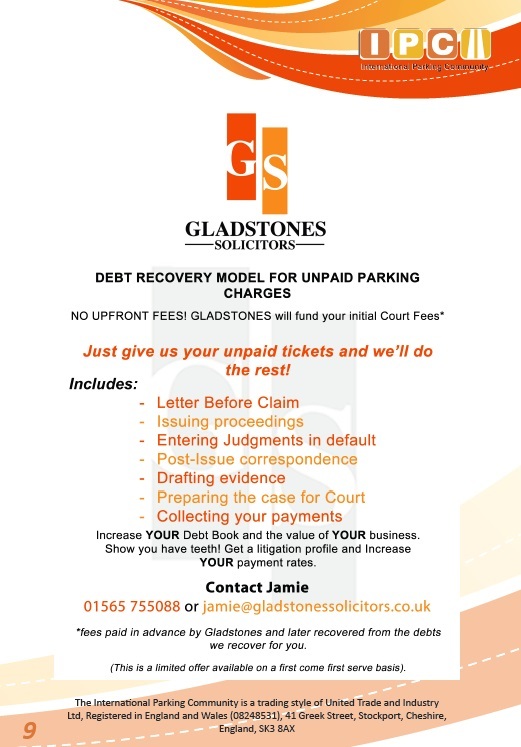 On a separate note, if you are fighting a parking claim in Skipton, and the particulars of claim are not clear, you should bring it to the attention of the court. Excel have a long track history of not bothering to file proper particulars at any court, let alone Skipton. The Prankster congratulates Mr Lamilad, for his assistance to the defendant, along with Coupon mad, Bargepole and everyone else who assisted. Murdo Fraser MSP has introduced a bill to regulate the car parking industry. Several of Mr Fraser's constituents have fallen foul of Smart Parking, a company with a chequered history. Their low standards and deficient machinery have caused huge numbers of motorists to be issued charges when they have not transgressed. Their appalling behaviour may be the tipping point behind this bill, rather like the clamping in Changegate Car Park, Haworth of the car Betty Boothroyd was travelling in may have led to the banning of clamping in England and Wales. The bill aims to address the issues of excessive charges, the inconsistency of signage, the process for appealing imposed penalties, and the presentation of invoices. More controversially, to ensure that issues of 'fairness' to operators are also considered,the bill also aims to examine the introduction of keeper liability, which would help operators to identify those who would become liable for charges. Anyone wishing to reply to the consultation needs to do so before 2 March 2018. I listened in on the above case this afternoon, where UKPC had issued 7 tickets in a six month period last year to a resident of a block of flats. The claim was for just over £1100.00. Six of the tickets were issued for not parking in her allocated bay, and 1 ticket was issued for not parking within a marked bay. Ms H explained that, due to drug users frequenting the parking area (due to broken security gates) she had not felt safe parking in her allocated bay as the area was littered with needles. Instead, she parked in a well lit communal area within the apartment block grounds, close to her apartment and displayed her permit. Several complaints were made to the landlord, but these fell on deaf ears. SCS sent a Ms Hurley to represent the claimant. She provided photos of the vehicle on 6 occasions parked in the communal area. She also provided one photo of the vehicle in pitch dark alleging that it was not parked within a marked bay - it was so dark you could not even see any bay markings! After hearing both sides, the Judge dismissed the claim as the landlord had not addressed the issue with the needles and therefore, as Ms H had complained on several occasions, Ms H was not able to park in her allocated bay and had parked in a safe, well lit, needle free area instead. Ms H was understandably very upset by the proceedings and was extremely relieved by the outcome. She didn't want costs and just wanted to go home. Sadly some parking companies have no intention of operating a proper residential parking service. Their sole intention is to gouge residents by creating an inappropriate set of rules conducive to issuing as many charges to residents as possible. It is clear to The Prankster that UKPC, owned by Rupert John Williams, is one of these companies. UKPC have a long history of deceit and malpractice. They have been taken to court by Trading standards twice, and their wardens have been caught manipulating photographs to pretend motorists overstayed. The Prankster believes that reform is long overdue for this company. It appears the British Parking Association (BPA) are ready to seal off the UK from the rest of the world as this MSE thread shows. BusyBee1904 received a notice to keeper from NCP for a parking event. As they were not the driver, they discharged their responsibility by providing the name and address of the driver, who lived in Germany. Here is where things got a little weird. NCP refused to accept the address, and continued to chase BusyBee1904 for the parking charge. BusyBee1904 therefore filed a complaint with the British Parking Association who came up with this perposterous response. "I am advised that a name and full address was provided for the driver, however, as the person concerned is a resident of Dusseldorf, outside of the UK, the operator was unable to accept that as a serviceable address. Schedule Four of the Protection of Freedoms Act 2012 requires a serviceable address to be supplied in order to transfer liability. As none has been supplied, the liability has reverted back to the Registered Keeper in accordance with the legislation." Here is the requirement from the Protection of Freedoms Act, 2012 (POFA). a current address for service for the driver. So what is a "current address for service"? Well, that is conveniently defined at the beginning of the Act, in paragraph 2(1). As the address where the driver resides has been supplied, a "current address for service" has clearly been supplied. The second condition has also clearly been met. For the benefit of the British Parking Association, the way to conveniently contact somebody living in Dusseldorf is via something those of us in the know call a "letter". You pop this "letter" in an "envelope", write the address on the outside and stick on a prepaid delivery charge those of us in the know call a "stamp". Apparently some intrepid company called the Royal Mail is prepared to venture outside the scary boundaries of the United Kingdom for the princely sum of £1.05. Simply take this "letter" to them and they will do the rest. The Prankster understands that the BPA might not yet have progressed beyond carrier pigeon, and that the attrition rate of these is unacceptably high across the channel. He is happy to advance parking knowlege several centuries and introduce the BPA and their clients to the heady delights of the "post". No charge has been made for this educational service. Here is what Practice Direction 6 says about a legal "address for service"
It does therefore seem strange that the British Parking Association has chosen to refine "address for service" in a manner which neither complies with POFA or with the legal definition from practice directions. The Prankster therefore recommends that anyone in a similar position raises complaints to the DVLA and the IOC, and also considers making a claim against the parking company for harassment and breach of the Data Protection Act. From May 2018, a data protection breach can cost a company €20 million or 4% of annual global turnover and therefore this is a very useful tool to use against parking companies wilfully ignoring the law and data protection requirements. I wish to raise a complaint about NCP. They are pursuing me for keeper liability. However, I have provided them with the name and address of the driver, who lives in Germany. As the driver both resides and can be conveniently contacted at the address given, it is clear that keeper liability no longer applies. I have also contacted the British Parking Association, who incorrectly stated that keeper liability still applied. Please therefore take the appropriate corrective action against both NCP and the BPA, and keep me informed of your progress. I wish to raise a complaint about NCP. They are breaching the first principle of the data protection act 1998 by using my personal data in a manner which is neither fair nor lawful. They are pursuing me for a parking charge under the keeper liability provisions of the Protection of Freedoms Act 2012. However, I was not the driver, and I have discharged my responsibilities under the act by providing the name and address of the driver, who lives in Germany. They are therefore using my personal data in a manner which is both unfair and unlawful by using it to pursue myself for the parking charge. (a) the defendant may be served with the claim form at an address at which the defendant resides or carries on business within the UK or any other EEA state and which the defendant has given for the purpose of being served with the proceedings. I wish to raise a complaint about your actions. You are breaching the first principle of the data protection act 1998 by using my personal data in a manner which is neither fair nor lawful. You are pursuing me for a parking charge under the keeper liability provisions of the Protection of Freedoms Act 2012. However, I was not the driver, and I have discharged my responsibilities under the act by providing the name and address of the driver, who lives in Germany. This is therefore a breach of the first data protection principle, which states data must be used fairly any lawfully. The data protection act provides that damages can be claimed if a breach occurs. Your continued actions are causing me stress and distress, and this therefore also constitutes harassment under the Protection from Harassment Act 1997. 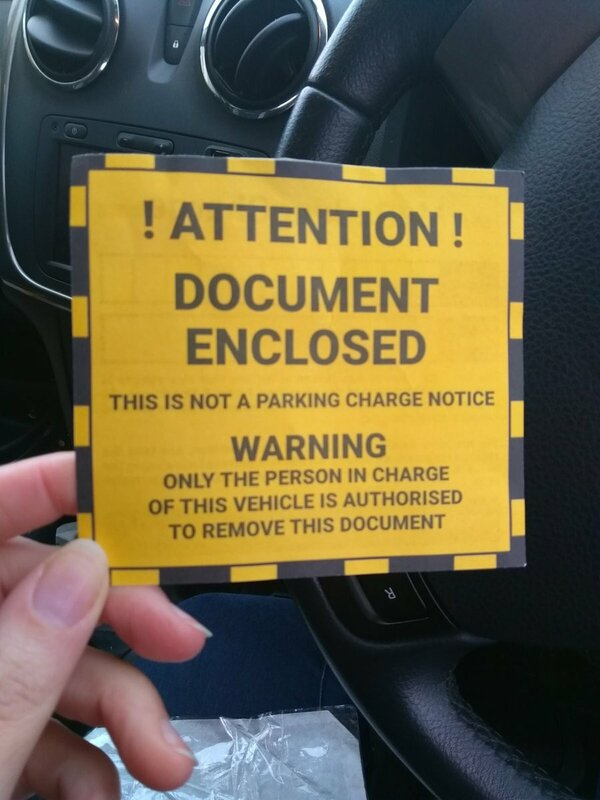 I therefore request that you immediately confirm you will no longer pursue this parking charge, and invite your offer to cover reasonable damages. If you fail to reply within 14 days I reserve the right to take legal action. I am open to appropriate alternative dispute resolution. Please therefore also view this as a challenge to the parking charge, and issue me with a POPLA code. The Prankster has previous blogged that POPLA view an address for service as valid even if it is abroad. Ms O parked her car in Albert Street, Birmingham in 2014, entered her registration and paid the correct amount. She was certain this was done properly. As the car was a hire car she had taken special care to enter the registration correctly. Vehicle Control Services disagreed, and issued a parking charge. Ms O contested this at POPLA and sadly the POPLA assessors believed VCS over Ms O and the appeal was declined. At this point Ms O contacted The Prankster for help. The Prankster checked the POPLA evidence pack and noticed that the signage at this car park was in the name of Excel Parking, and not VCS. Sadly, the incompetent assessors at POPLA had not noticed this. This of course meant that VCS had no contract with Ms O and therefore no right to pursue any parking charge. The Prankster helped Ms O point this out to VCS, and also over the course of a few years to their debt collectors Rossendales and BW Legal. The Prankster also helped Ms O file a complaint with the Credit Services Association, complaining about the bullying and misleading letters she had been sent by BW Legal. BW Legal filed a claim anyway, and Ms O filed a counterclaim for misuse of her personal data. VCS had a long history of filing court claims regarding this car park, but pulling out if the defendant raises the defence that the signage was not in their name, such as VCS v Zozulya, claim A8QZ6666 and VCS v Ms M, claim 3QZ53955. It is therefore clear to The Prankster that they were fully aware they had no valid claim, and that this was therefore a speculative claim and an attempt at bullying Ms O into paying up. Despite this, BW Legal got their 'Litigation Executive' Rohan Krishnarao to file a reply to defence stating that he felt the defence was embarrassing for its lack of particularity. He asked for the defence and the counterclaim to be struck out. This is a standard trick by BW Legal and as far as The Prankster can tell, dear Rohan puts this on all his cases regardless of merit. Perhaps this is a trick he learned while studying law at Cardiff University. The first hearing was an allocation hearing on Monday 23 Jan 2017. Interestingly, the week before the hearing, the Prankster got hold of a document from the BW Legal dated 18 November stating that VCS had ordered BW Legal to stop pursuing Ms O. As BW Legal were still pursuing Ms O, The Prankster wondered what was going on. Prior to the hearing The Prankster tried to give this document to BW Legal's solicitor, a bad tempered older gentleman. He refused to accept this and started ranting that Ms O had no legitimate counterclaim as her details had been validly obtained from the DVLA. Obviously he had not read the case notes - as this was a hire car, the DVLA would not have had her details to give out. The Prankster decided to leave him to his own devices. Immediately the hearing started, the solicitor announced that VCS were discontinuing the claim. This left only the counterclaim. The judge ordered Ms O to file more detailed particulars. The solicitor asked if they could have a directions hearing once these were filed. Despite asking for a directions hearing, VCS had no directions they wished to ask for. Neither did Ms O. The judge therefore gave the only direction he could, which was to set a date for the next hearing. In passing he mentioned that he heard most of the parking cases in Birmingham and initially thought this was another run-of-the-mill case until he realised that the claim was discontinued and only the counterclaim was valid. He was now sad that he would not be hearing it, as it looked rather interesting. He did mention that the particulars looked overly long, at which the Prankster had to smile a wry smile, as they had been asked to lengthen them at the previous hearing. After the hearing the BW Legal representative, a younger chap, confided that he had no idea why the directions hearing had been asked for. He speculated it might have been an attempt to discourage Ms O from continuing by introducing extra hearings. There was some confusion over the hearing fee for the counterclam hearing. Ms O attempted to pay it, but the incompetents at BW Legal had for some reason already paid the £25. VCS engaged Ms Empson, who introduced herself as a barrister. Ms O was represented for the third time by The Prankster. There was a pre-hearing discussion. It turned out BW Legal had given Ms Empson the wrong paperwork and the old particulars of claim. The Prankster allowed her to photocopy his copy. She said a counterclaimant witness statement had not been filed. The Prankster replied they were relying on the particulars, which were also a statement of truth signed by the counterclaimant. BW Legal had also not filed a witness statement. However, after some discussion it turned out they had, but for some unaccountable reason had sent it to the wrong address, despite no other claim paperwork going there. Ms Empson showed The Prankster the witness statement which turned out to be the same as their defence. As it was not introducing new material, The Prankster was happy to continue. Ms Empson explained she would be attacking the defence for not showing any loss. The Prankster explained he would rely on Vidal-Hall v Google on that point. In the hearing the DDJ got immediately stuck into the minutia of the Data Protection Act and quizzed The Prankster fiercely on what the personal data was and what the exact breach was. There was quick agreement that the issue was around principle 1 - was data processed fairly and lawfully. The DDJ then dived off down subclauses (a) and (b). The Prankster explained he was not claiming non-conformance with the subclauses; only the 'fair and lawful' provision. There was then some argument on when the breach occurred. The Prankster explained that in principle VCS could start the process of asking for a parking charge. However the breach occurred once they had been informed that their claim was not valid and they continued for several years to press on anyway, causing distress and harassment. The Prankster could see the DDJ was in two minds. At this point the hearing still had not got into why the parking charge was not valid, so The Prankster asked the DDJ if he might explain this, as he thought this would help. He read the first line of the sign from the bundle. "By parking here you are entering into a contract with Excel Parking". He stated it was basic contract law that a third party could not sue on a contract between two other parties. He asked what VCS were doing bringing a court claim in the first place as only Excel had the right to do this. The judge had a light bulb moment. He said VCS could act as agents for Excel, and collect money on their behalf, but only Excel could bring a claim. He asked Ms Empson if she had anything to add. Unsurprisingly she did not. 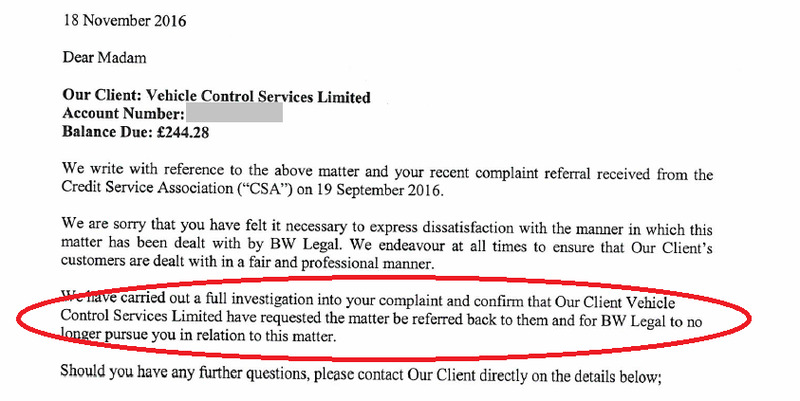 The hearing then went through the letters to Rossendales and BW Legal explaining to them that the charge was not valid because VCS were not a party to the claim, and their template replies totally ignoring the issue. The hearing also went through the other claims VCS had filed and then discontinued. The hearing examined quantum of damages. Ms Empson stated Ms O had never listed her costs. The Prankster explained the costs were trivial; postage and printing, and not worth individually listing. Instead, he was relying on Vidal-Hall v Google and the costs took into account the distress caused by 2 years of letters which were all template replies never addressing the issues raised. The amount was set both to reflect this distress, taking into account the level of the parking charge and the need to set an amount to stop parking companies claiming money they were not allowed. The judgment was then made. The judge found that the data processed was personal data. The judge found that it had been processed unfairly and unlawfully. However, for technical reasons he found that in this particular case, there was no breach. However, despite that, he said that the court had other methods whereby he could deal with claimants who abused the court process. He then went on to costs. He explained that although the counterclaim failed, the courts themselves had discretion to address the matter. He stated that VCS had behaved unreasonably in bringing the claim after such a long time; when they had been informed of the reason for failing; when they had brought and discontinued other claims. Ms Empson contested that the claim was not unreasonable but the DDJ disagreed.. Costs to be paid within 14 days. Although this case was lost on a technical reason, this applied only to this case. The Prankster believes that other similar cases would succeed, and also that if Ms O appealed, she would have had a good chance of success. However, for obvious reasons, she chose not to. What is good news is that Simon Renshaw Smith's greed and utter lack of morals in pursuing this case has led to his comeuppance and a substantial loss for his company. All told, this is well over £1,000. Perhaps Simon has a valid claim against POPLA. After all, if they had done their job properly in the first place, the appeal would have been upheld then. It also means that if Simon brings any more cases for Albert Street, Birmingham using the wrong claimant he would likely be facing another substantial costs ruling. PPS wished to charge Ms B, a resident, for parking in her own space while not displaying a permit in her courtesy car. Ms B retorted that she had been a resident for 20 years, that she had the right to park in her own space, and that PPS had no rights to issue charges to her. PPS disagreed and so instructed the famously incompetent Gladstones Solicitors to file a claim on their behalf. As can be expected if you hire joke solicitors, things did not turn out well for them. Gladstones did not bother to follow the directions the court issued, and did not bother to file a bundle until after the hearing had actually started. When they did, it was their usual template nonsense, shoddily thrown together and worse than useless. The bundle promised to include an agreement from the landowner authorising parking management, but did not. The parking attendant, Jakub Gajewski, who is also the sole director of PPS issued two witness statements, one of which claimed that he made physical or verbal contact with the driver. This was incorrect. During the hearing, PPS were represented by Mr Wogan. Ms B was represented by counsel. DDJ Chohan was suitably unimpressed by the way Gladstones had conducted the case, finding that they had not complied with the directions previously issued. The claim was dismissed and costs of £350 were awarded under the unreasonable behaviour rule, 27.14(2).g. Jakub Gajewski has previously been blogged about due to the underhand and devious tactics his operators use. He was kicked out of a car park in Ashford, but continues to file claims, although he has lost all reported cases. There is now a civil restraining order being sought against him. In this newspaper article he claims to operate 300 car parks, although this seems to be unlikely, particularly as he acts as one of his own car park attendants. In short then, he appears to be a rogue. As such he is in good company employing Gladstones Solicitors, and their rogues gallery of Will Hurley, John Davies, Jamie Ashford and Helen Cook. None of these five seem to have the faintest idea of the law surrounding parking. It is a strange world that we live in, given that these people are directors of parking companies, directors of parking trade associations and solicitors specialising in filing claims for parking charges. PPS are now £350 worse off, plus the cost of their own representative, the court costs of £75 and the costs of instructing Gladstones. When you employ a firm of solicitors who appear blissfully unaware of the requirements of the court process, let alone the issues surrounding parking claims, this is what happens. This is not an isolated incident - Gladstones are a byword for incompetence and shoddiness. This week The Prankster referred to the case of Mayhook v NCP. In that case Nigel Barrington-Fuller, an ex-barrister towed away Mr Mayhooks car from an NCP car park and refused to return it. Mr Mayhook successfully sued NCP and Barrington-Fuller, and was awarded damages and costs. As a postscript to this story, it has now emerged that Barrington-Fuller has not paid NCP monies owed to them and had therefore been made bankrupt in May 2017. The story was reported on pepipoo. It is not known whether the monies owed had anything to do with the Mayhook case. This did not include NCP or Mr Barrington-Fuller's costs - presumably they shelled out a similar amount. It is therefore quite possible that the bankruptcy concerned monies that Barrington-Fuller owed to NCP as part of this settlement. However, this is of course just speculation. The IPC appeals service, the IAS, has been regularly exposed as a kangaroo court which does not provide a fair or independent appeals service. Instead, it is institutionally biased towards the parking operator. follow which achieve almost exactly the opposite. For example, in the civil courts the burden of proof is on the claimant. Although Bryn is apparently a barrister, and therefore should know this, he has created an appeals service in which the exact opposite applies. However contrary to this, on Bryn Holloway's misguided orders, his lackeys regularly assume that the keeper was the driver even though the parking companies offer no evidence whatsoever. Even worse, evidence the keeper provides to show they were not the driver is regularly ignored. In one case the Prankster helped with, the parking company stated on the driver was male. The keeper was female and therefore any fair appeal service would find for the keeper. However, this was not good enough evidence for the IAS. The keeper also provided witness statements from the occupants of the vehicle that she was not even present at the time of the incident (she was at home preparing a meal). Even this was not good enough for the IAS! The appeal was dismissed. Of course, it is not possible to run a fair appeals service which believes whatever the parking company states, however incredulous, while simultaneously disbelieving the evidence of the motorist. When motorists complain they have received a poor decision Bryn routinely refuses to investigate and instead sends out a template letter stating that he cannot investigate because this would compromise the service. Of course, this is smoke and mirrors. Any proper appeals service would properly investigate complaints. The Prankster therefore has no hesitation in saying that based on the available evidence it appears that Bryn Holloway is an incompetent fraud who lacks the experience, moral fibre and legal knowledge to run an appeals service fairly and properly. In the Prankster's opinion he has zero credibility and should seriously consider whether he is the right person for the job. Bryn's lackeys hide behind the cloak of anonymity. The Prankster believes that this is because if their names were to become public they would lose all credibility in the legal community. The Prankster therefore has no hesitation in saying that based on the available evidence it appears that Bryn's minions are either biased or incompetent, and have no place in serving on an appeals service. Here is one recent example of the IAS's bias and incompetence. The motorist parked in a car park in Folkestone run by CPM a couple of months ago. It turned out the ticket machine was out of order; a small group of people gathered round it and one person phoned the number given. She was told to text the car reg no to the mobile number given, which the motorist duly did. Two hours later they returned to find a PCN recently affixed to the car. The motorist appealed to CPM, which was declined, and then in due course to IAS where the appeal was also dismissed. At no point was the point answered that the motorist had sought out and obeyed the instructions of the parking company. The Prankster firmly believes that if this goes a claim the parking company will be laughed out of court by the judge. Essentially an oral change to the parking contract has been discussed and agreed by both parties, and this will therefore take precedence over any signage. The fact that Bryn Holloway fails to understand this proves in the Prankster's eyes that he is not a fit person to run an appeals service and that his knowledge of contract law is shaky at best and non-existent at worst. Clamping is back! But is it legal? The Times this week reported that some car parking companies are attempting to bring back clamping. The situation arises at station car-parks where byelaws are in force. The British Parking Association has recently told its members that they do not need to offer an independent appeals service for tickets issued at these car parks, which means that POPLA is no longer available to motorists. This immediately sets alarm bells ringing. Indigo, one of the companies who manage railways car parks, lost 90% of their POPLA appeals in 2016. As any parking tickets are issued under byelaws, the next available step to a motorist who wishes to dispute a ticket is to wait for the parking company to prosecute the driver at a magistrates court. Essentially, the payment of the £100 charge to the parking company is equivalent to a bribe to stop them taking the process to court. However, the court route opens up more problems than it solves. The first problem is that the Protection Of Freedoms Act 2012, sch 4 does not apply, and only the driver is liable to any charge. As this would be a criminal case, the burden of proof is on the prosecution and that burden is significantly higher in criminal than civil cases. We have seen that similar cases where POFA does not apply and the driver is not known are routinely thrown out of civil court, and this would therefore be even more likely in criminal court. The byelaws do also provide that the owner may be liable, but this is not necessarily the same as the registered keeper. As all the TOC knows is the name of the keeper, this leaves them with a tricky problem. For instance, with many vehicles, the actual owner is a finance company. In addition, there is the possibility that the supposed ability to fine the owner may be ultra vires, as the enabling regulation (Transport Acts) only refers to "conduct of persons while on railway property". Chances of successful prosecution are therefore seriously diminished. The second problem is that any case must be filed within 6 months. Unlike civil cases, where a debt can be pursued for up to 6 years, there is a much stricter time limit for bye-law cases. If the parking company dilly dallies, they will find themselves timed out. The third and more fundamental problem, is that the penalty for breaking a byelaw is a fine, and any fines levied go to the state. The parking company gets nothing. There is therefore no financial incentive for them to take a driver (even if they can identify them) to court. GTR have stated that they will "target only persistent offenders who aren’t buying tickets and owe us large sums as a result." The premise being that if somebody continues to dispute that a parking charge is owed, then one day they will return to the station to find their car clamped. The car will not be released until all the parking charges are paid, together with a release fee. However, the legal basis for this appears to be extremely shaky. The Prankster has seen an extremely insightful analysis by a former barrister which identifies five reasons why clamping in these circumstances is probably unlawful. a) Train Operating Companies do not have lawful authority to clamp/remove. Any attempt to use the Railway Byelaws 2005 to grant that authority is ultra vires, for the power to make such a byelaw was not granted – either expressly or impliedly - by Transport Act 2000.
place, and (b) incorporate the required level of regulation. require an associated appeal process) would be illegal. the clamp would be another form of extortion. There is a similar previous case on the record. In Mayhook v NCP, NCP confiscated Mr Mayhook's car and refused to return it. After a long legal battle they found themselves a five figure sum lighter. makes it a criminal offence to seize property over alleged unproven debts. In summary, the removal of the motorists right to independent appeal and the reintroduction of clamping appeal to be ill thought out and likely to introduce more issues than it solves. What should a motorist do if they find their vehicle is clamped on returning to the station? POFA 2012, schedule 3, chapter 2 provides that it is a criminal offence to immobilise a vehicle without lawful authority. The above analysis strongly suggests that lawful authority is not present. One option would therefore be to involve the police. Although they might not be sufficiently au fait with the nuances of the law, they will at least be able to take down the details of the clamper so that they can be prosecuted for criminal activity at a future point in time. The police might also be persuaded to order the removal of the clamp in order to prevent a breach of the peace, but this is not guaranteed. Attempting removal of the clamp is another gray area. This may or may not be lawful depending on circumstances. It might be that the most prudent manner is to pay the charge, then immediately start the legal processes needed to reclaim any amounts paid, and also to invite the commencement of criminal proceedings against the clamper.